"My name, my records, all lies. Who am I? I am Noir"
Noir #2: The Hit List continues the adventures of Mireille and Kirika, two professional assassins who carry out contracts together under the code name "Noir." The premise remains largely unchanged from the last volume�Kirika has no memory of her past, and Mireille is trying to discover more about her own, and they are working together only until their respective mysteries are solved. Like most anime series that must fill a season with 26 episodes, Noir's central arc is dragged out quite a bit, with only a small mention or flashback or puzzle piece in the average episode. Therefore, the show's success rests on the strength of a particular installment's mission. There is a lot of angst and classy music, but in the end, this is really a show about elaborate, pathos-enriched action scenes, and this disc includes a few that are fairly effective. In Lost Kitten, "Noir" is hired to kill a war criminal guilty of the murder of thousands of ethnic refugees, despite the fact that he has been living the life of a saint and feeding the poor since the conflict ended. Plus he takes care of a kitty, so he can't be all bad. 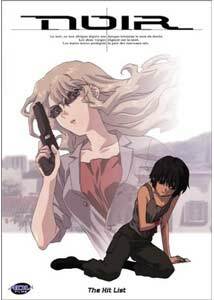 In The Black Thread of Fate, Kirika is wounded when she can't pull the trigger fast enough during a mission to kill a popular revolutionary leader. Her misstep makes it difficult for Noir to flee the country, and Kirika is kidnapped by those looking to avenge the murder. The final two episodes form a two-parter called Intoccabile Acts. The two assassins are in trouble with the mafia after killing a crime boss. To get back at them, the "Family" brings in a killer known as Intoccabile (Italian for "untouchable"), a young woman who had been banished from the mafia for killing her father. These two episodes provide some much needed insight into Mireille's past, and go a way towards explaining her ruthlessness on the job. Noir isn't a particularly deep show, but it is slick and compelling. Action sequences are nicely animated and choreographed, and haunting choral music provides a nice aural backdrop for the sometimes bloody assassinations. My favorite aspect continues to be the exotic locations�after watching so many series set in Tokyo, New Tokyo, Tokyo-3, Neo-Tokyo, and the like, it is nice to travel to an animated European countryside or a French villa. Image Transfer Review: This is a great-looking show, and one of the few anime available in anamorphic widescreen, so I'm happy to say that it looks great on DVD as well. Colors are spot on and show no blooming or bleeding. Blacks are deep and show good shadow detail. Fine detail is excellent, showing off the intricate animation quite nicely. I noted no artifacting, and just a touch of aliasing in a few shots. Audio Transfer Review: Audio is offered in the original Japanese or in nicely dubbed English. Both are mixed into DD 5.1 and sound quite good, though there isn't much difference between them. The surrounds enhance the score, and dialogue on both tracks is clear and anchored primarily in the center channel. Sound effects and the score are well positioned across the front soundstage. Extras Review: This disc includes a typical ADV anime extras package. There's the clean opening and closing animation, a gallery of production art, a few original Japanese promos, and an ADV trailer gallery with spots for Farscape: Season 2, Colorful, Excel Saga, You're Under Arrest: The Movie, Devil Lady, and Zone of the Enders. Noir is an atmospheric, moody episodic action series that pares out character development and motivation a little slowly for my liking, but it remains a stylish diversion. ADV has cut the episode number a bit for this volume, but these four installments are a worthwhile continuation of the assassin thriller.